Burp! Why does it Occur? Burping is a very natural phenomenon which starts as early as the babies take their first feed. When food is swallowed, it passes through the throat and into the esophagus which exits into the stomach. A burp occurs when there is a sudden rush of air from the stomach and is expelled through the mouth. The amount of gas that different foods cause varies from person to person. Gas is a natural byproduct of food digestion in the stomach. Burps are also symptoms of medical conditions of the digestive system. Some of the diseases associated with gas formation are gastritis, irritable bowel syndrome, GERD (acid reflux disease), lactose intolerance and ulcers. Eating certain types of food can cause unusual gas buildups in the stomach. This gives the stomach a sensation of fullness (bloating). The foods that can cause burping are - carbonated beverages like soda, energy drinks and beer. Other vegetables that can trigger the gas formation are cabbage, cauliflower, broccoli, beans, legumes, etc. 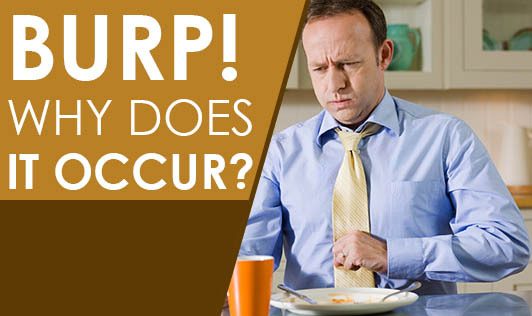 Eating large amounts of fatty foods does not only predispose you to dangerous medical conditions but they also cause burping. Fatty foods tend to stay longer in the stomach and cause gas to build up. Smoking and drinking cause gas buildups in the stomach. Lack of exercise and a sedentary lifestyle cause burping. Stress causes acid production, and triggers the gas in the stomach. If you feel your burp is excessive, consult a physician for further evaluation to rule out any digestive disorders or medical conditions!